I’m taking a summer classic up a notch. When I was grilling pineapple last week, my head was buzzing with all sorts of ideas for the grilled fruit. 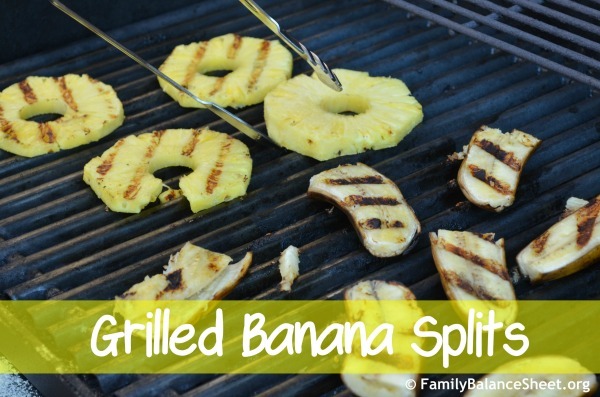 Why not grill bananas too and make homemade, grilled banana splits? 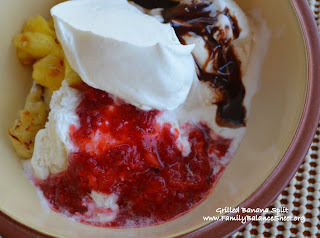 My husband and I LOVE banana splits, but they are usually the most expensive item on the menu at our local ice cream shop. So we made them at home, but I grilled the bananas and the pineapple. Grilling the fruit intensifies the flavor. I also pureed some thawed strawberries from our U-Pick excursion back in May and of course I made my favorite, homemade whipped cream. I used some chocolate sauce that was in our refrigerator, but that could be homemade as well. 1. Heat your grill to medium-high, at least 400 degrees. 2. Leave the skin on the banana and quarter the banana by cutting in half crosswise and lengthwise. 3. Rub butter on the cut side of the banana and place cut side down on a hot grill. Grill 2 – 3 minutes or until golden brown…and enjoy the wonderful smell. 4. Turn the bananas over to the skin side and grill for an additional minute. I grilled the bananas and pineapple together and the timing worked out fine. I just removed the bananas from the grill before the pineapple Be careful, the skins will come off very easily after grilling. I don’t have the fancy banana split boats, but I can assure you that I will be keeping my eye open for them at yard sales from now on. This is one dessert that I will be making again and again. Assemble the grilled bananas, your favorite ice cream, grilled pineapple, strawberries, chocolate sauce and whipped cream and ENJOY! Grilled banana split? I am speechless. And hungry.